Fly Creek produces an exceptionally scenic waterfall where it plunges 82 feet into a rugged canyon alcove, surrounded by high cliffs and huge boulders. 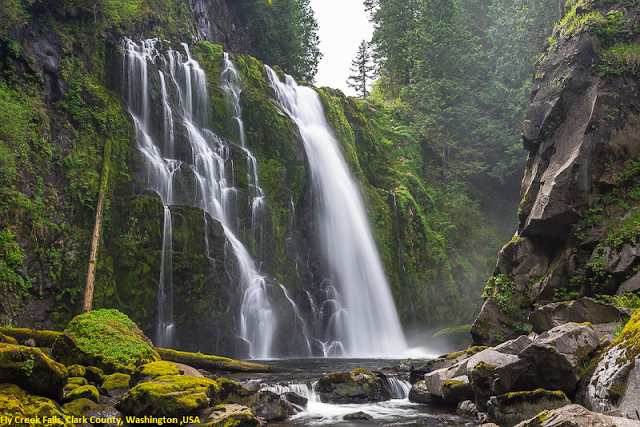 The falls are produced as its namesake creek flows across a broad bedrock shelf through a box canyon-like narrows, then slides sideways and spreads out over a 50-60 foot breadth of cliff and plunges to the pool below. During periods of heavy flow, the creek will spread across the cliff rather evenly and create a very powerful fall, but later in the year as the volume of the creek drops the water segments and creates several distinct channels. Fly Creek Falls is located near the towns of Chelachie and Amboy south of Yale Lake. From either Woodland or Battle Ground, take SR 503 to the town of Chelatchie, and then turn east onto NE Healy Road, which turns into FSR 54 after about a mile and a half. Continue two and a half miles from Chelachie to a gate across Road 8200 on the right and park so as to not obstruct the gate - if you cross Canyon Creek you've gone too far by about 1.2 miles. Hike or bike up Road 8200 for 6/10 of a mile, then bear left at a junction and head down hill. In another 1.2 miles you'll cross Fly Creek on a bridge. After a very steep up-hill climb out of the canyon, bear right at a hard switchback at 2.7 miles, then right again at 2.9 miles onto a road which is pretty obviously not actively used. A washout at the 3.6 mile mark impedes travel by bike further, continue on foot from here if you brought a bike. The road winds along the ridge and then climbs a ridge at its end after 4.6 miles. At this point Fly Creek Falls can be heard in the canyon below. Travel from here on is considerably more difficult. Enter the woods slightly to the right of the end of the road, then descend generally southeast along the ridgeline, following the sound of the falls. Do not attempt to drop down to the creek, as you will encounter cliffs. Instead stay on the ridge until you encounter a tributary stream, then follow the stream down to its confluence with Fly Creek, essentially right at the base of the falls.